Can anyone tell me where voltage regulator is mounted? I,have looked everwhere and can't find it. 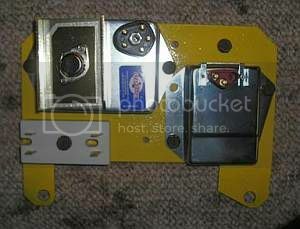 Check my photo album for picture of the alternator thats on my bago. Rusty - if you lift the dog house cover off and look straight down behind the distributor that's were it should be located. Here's what it should look like. 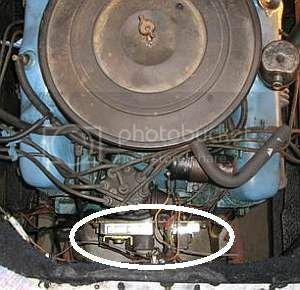 The pre-electronic ignition dodge had them mounted on a much smaller plate located to the left of the distributor. On my 72 (w/ 71 chassis) its mounted on the bottom/right side of the plate. 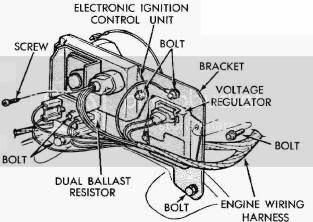 Does anyone know what type of regulator should be on a 1969 winnebago? We have just installed a standard vr106. Unfortunately it doesn't seem to be regulating the power to the battery. We are getting upwards from 17 volts. Unfortunately VR’s could be isolated or grounded and alternators need to match. If you have not already purchased the 69 - 73 Dodge Service Manual offered via this site really recommend you do. Per the manual, overcharging could be VR set too high, regulator contacts stuck, regulator voltage winding open, regulator base improperly grounded. Also, after many many hours of research I went with VR integrated “single wire” alternator to minimize wires and get rid of problematic ballast resister issues.